Elphinstone reef is renowned for its big pelagics. So far, I have been quite unlucky. 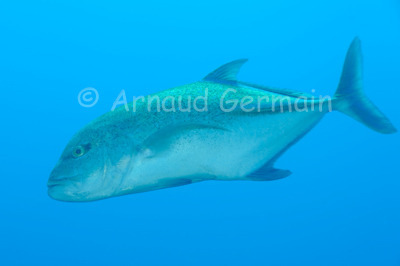 But I took this picture of a Bluefin trevally swimming in the blue as we were finishing a dive. It stayed near us for about 5 minutes. Nikon D700, Nikon 28-105 mm macro at 85mm, F8, 1/80th, ISO 200, Ikelite Housing and Ikelite DS160 strobe set on Manual x1/8. Elphinstone Reef, East Drop Off, about 10 metres down, Marsa Alam, Egypt.